Capman Chess Blog Capman Chess Blog: Garry Kasparov back on chess track. 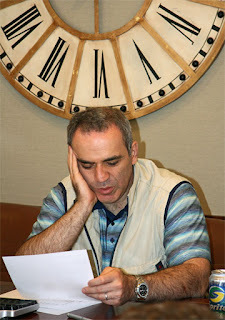 I read an article in chessbase and found about latest news of Gary Kasparov. Garry Kasparov: he's back and he's – teaching! 24.06.2008 – What brings a dozen young and talented chess kids to a skyscraper somewhere in the middle of Manhattan in New York City, on a pre-summer weekend in June? Why would those same kids completely take over the richly decorated, large conference room on a top floor, belonging to a successful financial company? To learn chess from the greatest, that's why. Report by Aviv Friedman.